Get ready for a change of scenery with the semi-alcoholic seaplane pilot, Sterling Archer, a lush on the lush South Pacific island of Mitimatu in 1939. While the rest of the world is concerned about the impending Second World War, Archer is only concerned with who's buying his next drink. Along with his trusty co-pilot Pam, Archer must navigate quicksand, cannibals, super-intelligent monkeys, poison darts, pirates, and did we mention quicksand? 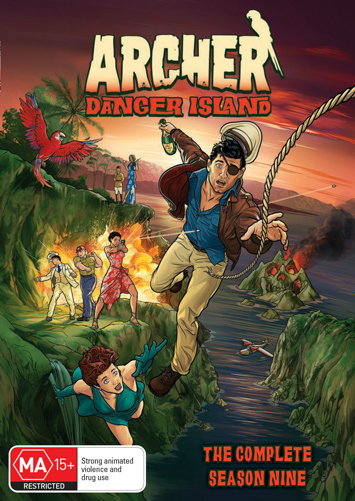 Welcome to the mysterious and deadly world of 'Archer: Danger Island', with special features including 'Inside Look: Making Archer' and 'Cracker’s Costumed Playings'. The 'Archer Season 9' competition has now closed. Winners will be announced shortly. Competition opens at 5pm AEDT on Sunday 3rd February 2019 and closes at 11:59pm AEDT on Sunday 10th February 2019. Five winners will be chosen at random on Monday 11th February 2019. To successfully win, entrants must fulfil the above entry conditions before the time the competition closes. Current members/followers are eligible to enter the competition. Only one entry per person. Only one winner per household. To be a valid winner, the entrant must not have won a prize from SWITCH within the last 28 days. Each winner will receive one DVD copy of 'Archer Season 9'. By entering, you agree to receive occasional emails from SWITCH in the future. If you decide to unsubscribe from these updates, any further entries will not be applicable. Only Australian residents are eligible to enter. 'Archer Season 9' is available on DVD on Wednesday the 6th February 2019 from Twentieth Century Fox Home Entertainment.